Hello friends! I am excited to design with the Blogging Friends Blog Hop today. 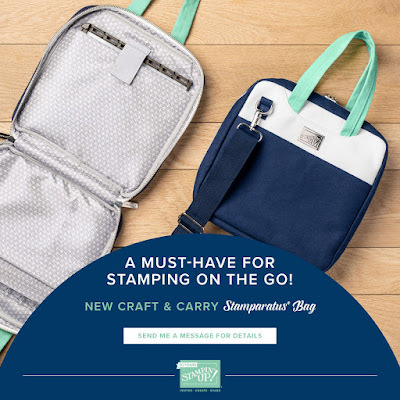 My friends and I are all Stampin' Up! demonstrators and we love to create new designs to inspire our readers. Today we are sharing projects to help you Ring in the New Year. The Gold Foil-edged cards and envelopes is my favorite product this month. They are a fantastic card base and the gold is very elegant. 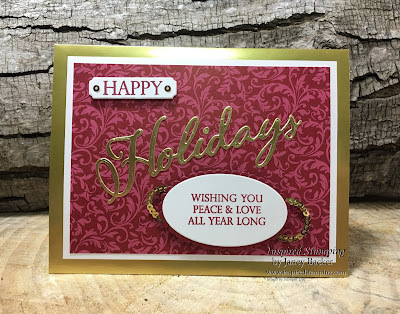 I paired the Merry Christmas to All bundle and Dashing Along designer series paper, with gold elements to create a celebratory theme for New Years. 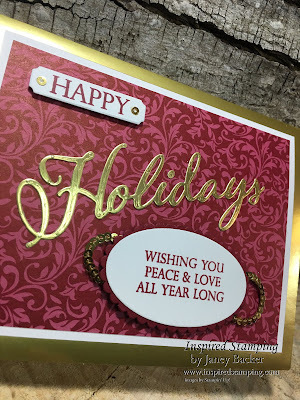 I love to use the Multipurpose Adhesive sheets as a backing onto the Gold Foil paper. The die cut "Holidays" word was so simple to cut, peel the protective paper off, then press the adhesive onto the card. Voila! It was really hard to see the layers in my first photo. So here it is angled to see the scalloped oval Cherry Cobbler layer beneath the Whisper White oval sentiment. The loops of Gold Mini Sequin trim is attached with SNAIL onto the back of the Cherry Cobbler oval. Then I placed Dimensionals over the ends of the Sequin trim to hold it all securely. My project supplies are listed at the end of this post. I hope you enjoy the wonderful projects made by my friends. We are excited to see you send cards to celebrate the New Year! Please use the list below to visit each blog. The host code closes on December 28th.